3D SUM values are great for calculating figures across a variety of different tabs. Say you want to track your daily expenses over a certain period of weeks, with each tab containing the information for a single week. You can use the 3D Sum value to a get the total for a particular category or your entire total throughout all your tabs. This will save you a lot of time, as opposed to going through each tab and adding up totals on your own. To begin, you can either download the sample Excel template below or use your own to follow along. 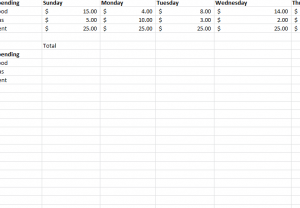 This formula works best with dollar amounts and as a budget tracking template. Once you have created your template with multiple tabs and data, you’ll be ready to start. First, decide where you want to enter your information to be placed within the spreadsheet. It might be helpful to add a “Total” column at the bottom of your page. After you have created your total table on the current week’s tab, enter the following 3D SUM values formula after clicking on the appropriate cell. When you have type the above formula and hit enter, the template will calculate the totals of all values in row B1-B7 and give you the final sum. Simply go through and do this for all categories, remembering to change the letter and number as you go. Also, note that if your tabs are titled differently, you must enter the actual title of your tab instead of the example, “Sheet1-Sheet7,” for your 3D SUM values. 3D Sum is a great tool to combine the data you have through multiple tabs into one comprehensive overview for sheets with the same format.